/PT/ Portuguese artist João Martinho Moura focuses on digital art, intelligent interfaces and computer aesthetics. 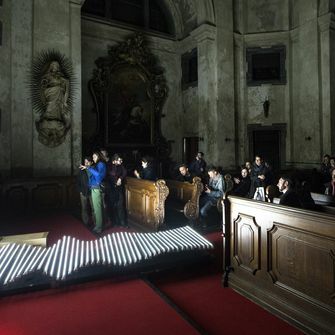 He has presented his work and research at a number of important conferences and festivals focused on art and technology, such as the Ars Electronica festival in Linz, the TEI international conference in Funchal, Portugal and the Chemins Numériques festival in the Saint­Exupéryho cultural centre in Remeš. In 2013, his work was awarded the national prize for multimedia by the Portuguese Multimedia Association. His works have been presented not only Portugal, but in countries including France, Belgium, Italy, the United States, Brazil, Israel and China. 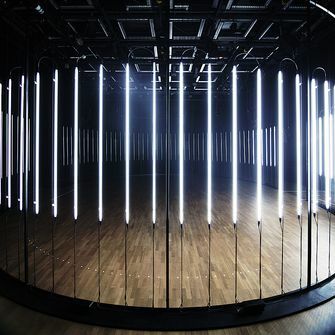 WIDE/SIDE is an interactive installation in which shapes, images, and sounds are joined and interdependent. A visually engaging block, captivating in its monochromatic conception and minimalist lines, serves as a projection screen and teems with conglomerations of lines and shapes. As a result the installation is always changing and acquiring countless different forms. 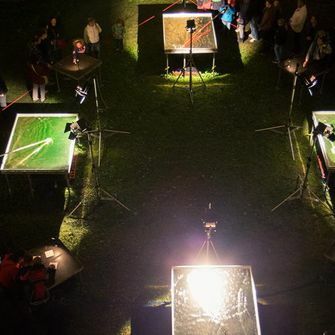 The individual forms of the projections in reality are based on the surrounding environment, responding to the movements and gestures of the viewers. Visitors and passersby therefore themselves become part of the work and define its appearance.